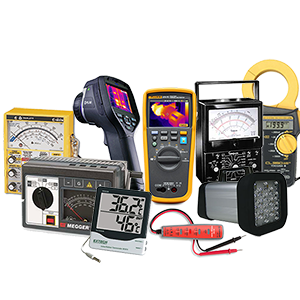 Byram Labratories Inc., has been a leading supplier of electrical test equipment and measuring tools since 1910. Byram stocks many product lines from the top manufacturers, and has built relationships with many independent manufactures, giving us the ability to be your one-stop-shop. Call Byram Labs to save time and money on your future test equipment and measuring tool needs. FLUKE- has achieved the number one or number two position in every market in which it competes. The Fluke brand has a reputation for portability, ruggedness, safety, ease of use and rigid standards of quality. Megger- designs and manufactures portable electrical test equipment. Megger products help you install, improve efficiency, reduce cost and extend the life of your customers' electrical assets. Flir- designs, develops, and manufactures technologies that enhance perception and awareness. Flir brings innovative sensing solutions into daily life through their thermal imaging systems, visible-light imaging systems, and measurement & diagnostic systems. Their products improve the way people interact with the world around them, and increase energy efficiency. Amprobe - builds rugged, reliable test and measurement tools that have been trusted by professional electricians and HVAC technicians for over 65 years. Their products range from an extensive line of clamp meters and digital multimeters to industry-specific tools for residential/commercial electricians, HVAC/R technicians, utilities and industrial maintenance professionals. Extech - Their single source strategy has made them the brand to turn to when it comes to tools that help prevent, identify and troubleshoot problems; whether it's electrical, mechanical, maintenance, safety or environmental applications, their products are trusted by the professionals and are put to the test every day. Simpson- has been a leader in the panel and test instrument industry since 1927. Today, Simpson continues its commitment to quality and innovation and is dedicated to the highest level of customer service and company growth. Yokogawa- is a leading provider of Industrial Automation and Test and Measurement solutions. Combining innovative and reliable technology with project management, engineering services, and maintenance, Yokogawa delivers field-proven operational excellence, safety, and reliability. Shimpo- has established itself over time as a leading supplier of drive technology and precision power transmission solutions to the industrial marketplace. Triplett - continues to innovate, and is known today for their full line of products in six major categories - Electrical Test & Measurement, Voice Data & Video Test, Security Camera Test, Vision and Inspection, Specialty Tools and Toolkits.